Saving you time, money, & frustration. I know all too well the frustrations and confusion that surface when folks are just starting out in the hobby, or even experienced fliers face when introduced to changing technology. I was no different and really wished I could get some quality help and information. Unfortunately I had to learn most of this RC helicopter stuff out the hard and expensive way - trial and error. These e Books I wrote are here to help you avoid such issues, while saving you time and frustration - hopefully have a little fun as well! This can be a complicated hobby after all, and our usual first stop for help is the internet. This is time consuming; not to mention the information is often segmented, and many times conflicting - even wrong. When you don't fully understand something, it's difficult to weed out the irrelevant and incorrect, while piecing together what is truly helpful, and then applying it to your specific helicopter and/or problem. Does any of that sound/feel familiar, and do you feel you are running in circles and wasting your valuable time in the process? If so, my eBooks contain all the relevant information in one place with no outside noise to distract or confuse. 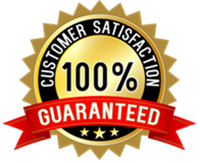 Most importantly to you, they all come with a 30 day money back satisfaction guarantee and I honor that! If you don't find the info helpful, you have lost nothing. I also pride myself on giving friendly help, so please don't hesitate to contact me with any questions you may have about my eBooks. Speaking of friendly help, I also answer questions that my eBook customers sometimes have related to a specific technical/setup issue on their particular helicopter. That help alone to many, is worth much more than the cost of the eBooks. "Hi John, I have been flying helis for 5 years and have many books. Since getting your ebooks yesterday I have not put them down. They are by miles the BEST instruction books on the subject I have ever read. The clear descriptions of the various setup functions have revolutionized my models." The highest costs and frustrations beginners face with collective pitch RC helicopters result from crashing. In all honestly, there is no reason you should ever crash when first learning to hover; provided you take a "ground up" approach and have your machine setup correctly for learning on. 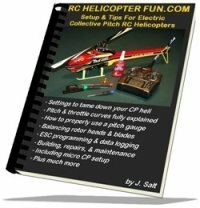 This RC helicopter eBook pays for itself many times over by showing you exactly how to turn a high performance electric or fuel powered collective pitch heli into a docile trainer to first learn on. Then progressing to more advanced setups from scale to aerobatics/3D, plus many more tips and advice. 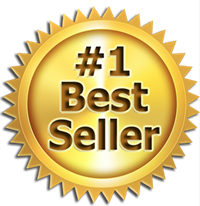 Click on the above image of this eBook to learn more about what's inside this best seller. 120/135/&140 CCPM electronic swashplate setup is by far the most intimidating and miss-understood technical setup process that most people face in this hobby. There are just so many things to set correctly. Top it off with flybarless configuration & tuning and it's perhaps one of the single largest learning curves when getting into collective pitch next to actually flying. I had a hard time myself figuring this out while I was making the switch first from mechanical CCPM mixing to electronic; and then from flybars to FBL. After being extremely disappointed with the lack of good information all contained in one place, in an easy to follow start to finish process, I decided to write this eBook. This is a fairly technical eBook with over 100 photos to help illustrate the many steps. In fact, once you go through the process and understand it, it's fun and really not difficult at all. From the smallest micro electrics to the largest turbines; if your heli has a 120, 135 or 140 eCCPM swashplate (flybar or flybarless) and you are intimidated by the setup process, this eBook will help you out. If you wish to learn more about what's inside this eBook, just click on the image of the book. My Setup & Tips eBook along with the Swashplate Levelling eBook are commonly purchased together since they complement each other so well. One covers the basics of RC helicopter setup, while the other dives into the intricacies of eCCPM swashplate leveling & FBL configuration. If you are considering both of these eBooks, I have introduced this "combo package" which will save you 25%! 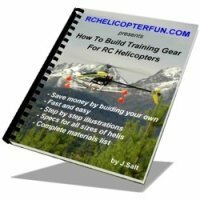 Building your own set of RC helicopter training gear is very easy and fun. You will save money by building your own gear and can customize the gear for your specific size helicopter. This eBook is fully illustrated with step by step instructions showing how easy it is for anyone to turn out a nice looking and very functional customized sized set of training gear for very little money (much less than commercially available gear in most cases). Covering micro size right up to large 800 electrics and 90 size nitros. If you wish to learn more about what's inside this fun "How To" eBook, just click on the image of the book. This fun and informative 90 page eBook will help you understand what makes the Blade mSR, mSRX, & 120SR tick. 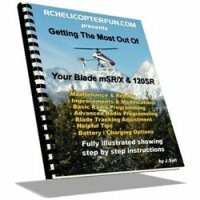 It gives you all the information needed in a clear and concise way to get the most out of the Blade mSR/X & 120SR RC helicopters while saving time, money, and frustration. If you wish to learn more about what's inside this fun eBook, just click on the image of the book. Unlike my other RC helicopter e Books that are very topic focused and specific, this 140 page eBook is geared towards the newest of newbies who are just starting to get into the exciting hobby of RC helicopters and are looking for an easy and informative read that covers all the basics. 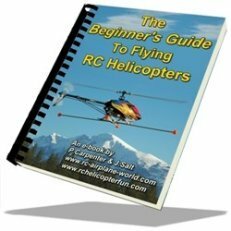 From the different types of RC helicopters available, to how they work, to how to fly them and what's involved - this 140 page, easy to read eBook covers all that and much more with plenty of helpful illustrations. If you wish to learn more about what's inside this helpful guide, just click on the image of the eBook. Thinking of getting into planes too, or trying to decide between RC helicopters or RC airplanes? If so, the Beginner's Combo deal which includes both the Beginner's Guide To Flying RC Helicopters and the Beginner's Guide To Flying RC Airplanes e Books, represents excellent value for anyone looking to get started safely and quickly in either or both forms of radio control flying. 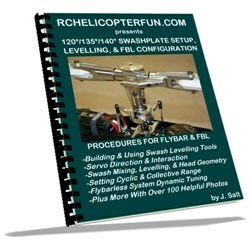 If you are specifically looking for additional RC helicopter eBook combo packages to save you a few bucks, here are a few popular combinations; again offering about a 25% discount over the individual prices if purchased separately. Combo 2 - "Heli Beginner's & Setups"
Combo 2: "Heli Beginner's & Setups"
Combo 3 - "Collective Pitch Essentials"
Combo 3: "Collective Pitch Essentials"
Combo 4 - "Big RC Heli eBook Package"
Combo 4: "Big RC Heli eBook Package"
Do You Have Further e Book Questions? Or feel free to contact me directly using the contact form below. I want to take a minute to thank you (again) for all the hard work on your site and supporting the hobby. Last December, I was ready to quit RC helicopters for good. Somebody on HeliFreak told me to go buy your beginner's guide and setup guides before I threw in the towel, and to damned well read them, too. So I did. A lot has happened since then. I was able to successfully get a Blade 400 3D and 450 3D running with training gear, thanks to your RC helicopter e books. I was able to make the transition to Flybarless once I could fly, in a complete vacuum of local help. I just took my time, followed your advice, and carefully set up everything one step at a time. To make a long story short, just three and a half months later I have a whole fleet going, and am enjoying this hobby more than just about anything I have ever done. I've got a GAUI X3L, 3 Goblins, and my original Blade helis I learned on. All of them have level swashplates, perfect center of gravity, and fly with no issues at all. I owe much of that success to your books. The community at large has done a good part to help too, but without your publications, I don't think I would have made it that far. I wanted to send you a final thanks. I think I said before that without your e-books, I never would've made it past my first three months, starting in December 2017. Now I'm flying light 3D without any crashes. Hurricanes are no problem. Piroflips are coming along. I'm even starting to get fast backwards flight and tick-tocks down. Any time somebody stops by the road and asks about getting into the hobby, I always tell them to start with your website. Many, many other people have mentioned it as well. And my neighbor Bill, 74, just got his first Goblin in the air. He started with your RC helicopter e Books.